REDWOOD CITY, Calif. -- Detectives in Redwood City are crediting Pinterest with helping reunite a family with a piece of jewelry stolen over 30 years ago, CBS San Francisco reports. 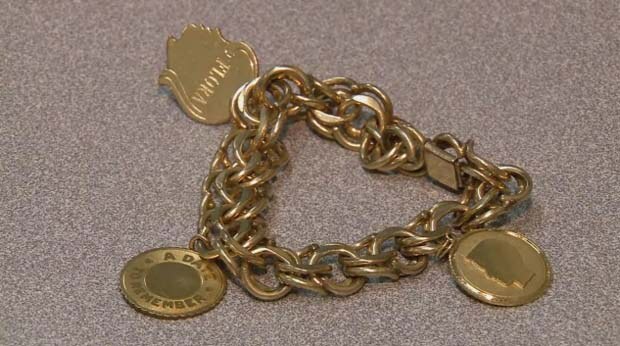 Flora Burke hadn't seen her mother's gold bracelet since it was stolen in 1983, but two months ago it turned up in a car during a traffic stop in Redwood City. Officers weren't sure they would be able to reunite the stolen jewelry with its owner, so Detective David Stahler decided to share photos of it on the department's Pinterest page. Tips started pouring in, and less than twelve hours later they led him to Burke. "This is a huge tool for us, especially for investigations like this with property that's hard to identify," Detective Stahler said. Burke was shocked by the news. "It was shocking to see me, to see the little me on there. I recognized it instantly," Burke told KPIX 5. She said she plans to visit her mother later this month with her daughter, and bring her the bracelet. "It's priceless. It's priceless," Burke said. "I'll be able to show it to my daughter and she'll eventually have it." The 32-year old woman who was found with the bracelet couldn't say where she got it from, but police say she wasn't tied to the original crime. She was arrested for possession of other stolen property.